Your holiday home is waiting for you in the Franconian spa town of Bad Bocklet amidst a 1000 sqm plot with mature trees and stunning views of the spa town and the hills of Vorrhön. Our generous Sweden house offers on 75 sqm with free Wi-Fi a fully equipped kitchen with dishwasher, ceramic hob and oven, two bedrooms, dining and living room with sofa bed and HD TV, bathroom and separate toilet, and two terraces. On cool days, a woodburning stove heats the living room and a marble slab heater heats the remaining rooms. You can park your car directly on the property. Of course you can use the garden area for barbecues or sunbathing. Towels, bed and table linen are included. 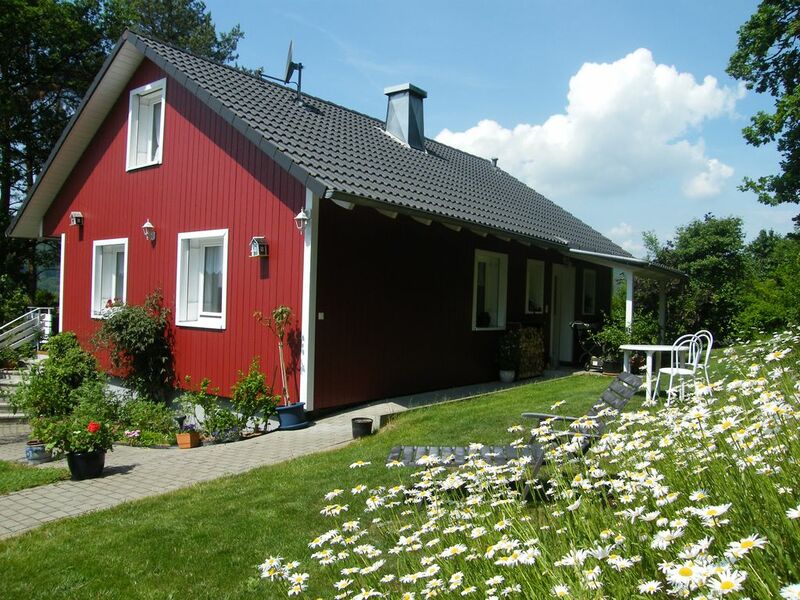 The house is an ideal starting point for excursions or bike tours in the Rhön Biosphere Reserve (eg Red Moor, Wasserkuppe, Freilandmuseum Fladungen, Kreuzberg Monastery) or along the Franconian Saale to the neighboring bathing towns of Bad Kissingen (10km) and Bad Neustadt (17km ) or to Hammelburg, the oldest wine town of Franconia (32km). Enjoy the KissSalis Spa in Bad Kissingen u. the water park Triamare in Bad Neustadt. Visit Würzburg with its World Heritage Site or the Franconian wine villages on Saale and Main. Enjoy the best classical music culture at the "Kissinger Sommer" or the theater events in the nearby theaters in Schweinfurt and the Thuringian Meiningen. Sehr schönes Haus, bei dem es an Nichts fehlt. Nette Vermieter und super Ausblick. Können wir nur weiterempfehlen. Auch unsere Luna hat sich sehr wohl gefühlt. Werden beide Schlafzimmer nur mit jeweils einem Gast belegt, dann fällt eine Zusatzpauschale von 30 € pro Woche an! Der Kurort Bad Bocklet erhebt derzeit 2,40 € Kurtaxe pro Nacht u. volljähriger Person. Für Haustiere zahlen Sie 3 € pro Nacht/Tier.